It’s still early March, but we’ve had some certifiable Spring days already this year. (One afternoon so mild, in fact, that farmer Stefan was able to take a kayak out on the river!) The warm weather and blue skies have got us thinking about fields and flowers again — and I’m sure we’re not the only ones. From your farmers’ perspective, there are several things to be excited about as we kick off the 2016 season, and we’d like to share a few of those things with you. First off, allow us to introduce you to the newest member of our mechanical crew — a shiny-fresh New Holland Workmaster 35. Ain’t it lovely? We purchased this new tractor in December, and we can’t wait to get it into the rotation this year. 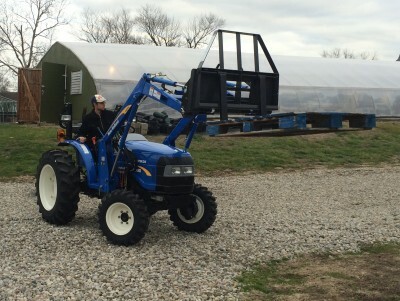 We brought the New Holland on board to meet a couple of needs on the farm. Most importantly, we wanted a machine that could handle our pallet fork work smoothly and reliably. We like to harvest some of our heaviest crops — e.g. melons and winter squash — into pallet-sized bulk bins that can be maneuvered by a tractor with pallet forks. Last year, we improvised a way to do this using a modification of the front loader on the John Deere, but that system … left room for improvement. We’re looking forward to tackling the melon & winter squash harvests this year with the right tools at our disposal. We’re also reassured to know that the New Holland can serve as a reliable back-up for three of our 1960’s-era International Harvester tractors. We love those IH machines, but after 50+ years of work, they do sometimes need to take a break for maintenance. 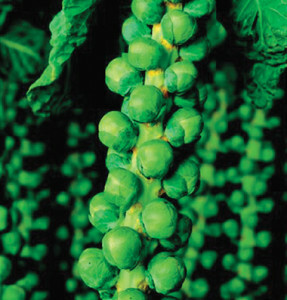 Of course, this tour of Spring excitement wouldn’t be complete without some talk about VEGGIES! During the winter, we looked through all the surveys that our members filled out at the end of last season, and we used those responses to adjust our crop plan for this year. We asked what crop you’d like us to add to the crop plan. Brussels Sprouts received the most votes, so we’ve added Brussels Sprouts to the plan. (There’s the catalog photo on the right, so you can start anticipating…) You said you wanted us to grow more Beans, Spinach, and Cauliflower. And so we’re going to plant more Beans, Spinach, and Cauliflower this year. Twice as much Cauliflower as last year, actually. You also said that you wanted us to grow more onions, and we took a good look at that situation. We lost a high percentage of our onions last year to some tough weather and soil conditions in their early life. Based on that experience, we’re confident that we can produce more onions next year without increasing the amount we plant. (Our 2014 onion yield, for example, was virtually twice as high as the 2015 yield with the same number of beds.) We want to say, “Thank You,” again to everyone who filled out a survey. That input really helps to guide our decisions as we evolve the farm from year to year. Beyond what we’ve mentioned above, we’re hoping to undertake one or two big construction projects this year. We’ll share more details about those endeavors as they take shape. Also, you might notice a couple new items in the flower patch selection this year: We’re experimenting with Sunchokes and Echinacea to see if we can get those established as perennials in the area where you saw the Alyssum last year. 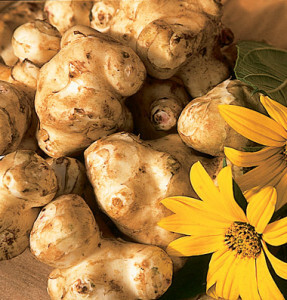 Both of those will add some new options for cut flowers, and the Sunchokes should yield tasty tubers in the fall (catalog photo on the right). We’re also adding Nasturtiums to the flower patch, so you’ll have the opportunity to colorfully garnish your Tinicum CSA salads with some edible flowers. We look forward to watching them grow. We hope that gives you an idea of some of things we’re looking forward to this season. The appearance of spring weather always imbues us with energy and an urge to get outside and get growing, and feeling that seasonal-psychological shift is part of what we enjoy about this work. We hope you’re feeling the Spring upsurge, too, and we look forward to seeing all of you again for our fourth season!